Sala Margana is a space for cultural and recreational activities: its antique family furnishings give it the feeling of a salotto, without limiting the range of possible initiatives. Everyone’s ideas can fill it and be enriched by the setting and its history. The Sala is located on the ground floor. A beautiful portal made from ancient Roman marbles opens onto the small private courtyard of the Palazzetto that once belonged to the Margani, a noble family that became extinct in the first half of the seventeenth century, but whose name remains in many of the area’s toponyms. The interior space is defined by three large columns with Roman Ionic capitals and an additional two columns partially incorporated in the walls, evidence of an earlier, larger courtyard, that set the rhythm of the groin vaults covering the Sala. 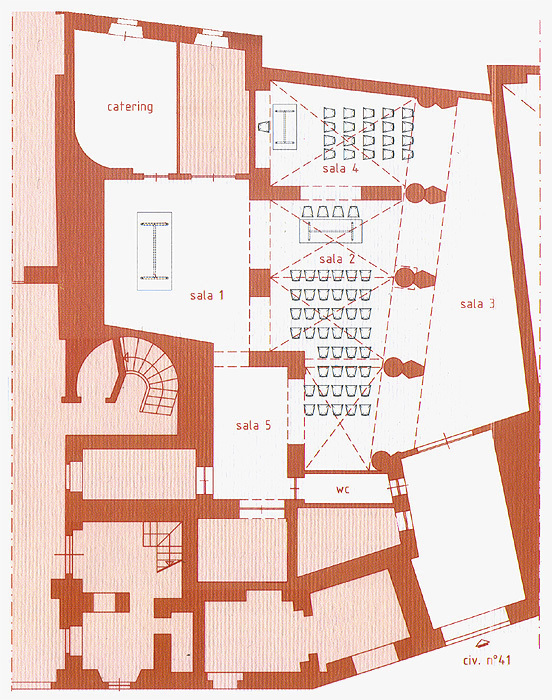 The Sala’s floor space is about 180 square meters and can seat up to 80 people (utilizing foldable chairs). As well as a bathroom, there is an adjoining small kitchenette with a fridge and stove. Furthermore the Sala is equipped with a projector and a screen, an amplification system. It is also possible to utilize the wi-fi internet connection. Over the years we have hosted associations or individuals who have given lectures, performances, conferences, book presentations, as well as concerts and private citizens wishing to celebrate birthdays and anniversaries in a special environment. The Sala is equipped with a continuous metallic track system running along the walls and bookcases (masked by custom-made panels) and a new suspended lighting system that incorporates both direct and diffuse illumination. The distinct floor plan and spatial arrangement make it an ideal space for a vast number of activities including exhibitions, conferences, chamber music concerts, public readings and much more.